Two people look out at the water after a shark attack at Newcomb Hollow Beach in Wellfleet, Mass., on Sept. 15. Massachusetts' last shark attack fatality was in 1936, according to a report by NPR member station WBUR. The Cape Cod District Attorney's office and the Massachusetts State Police are both investigating, Hurley said. 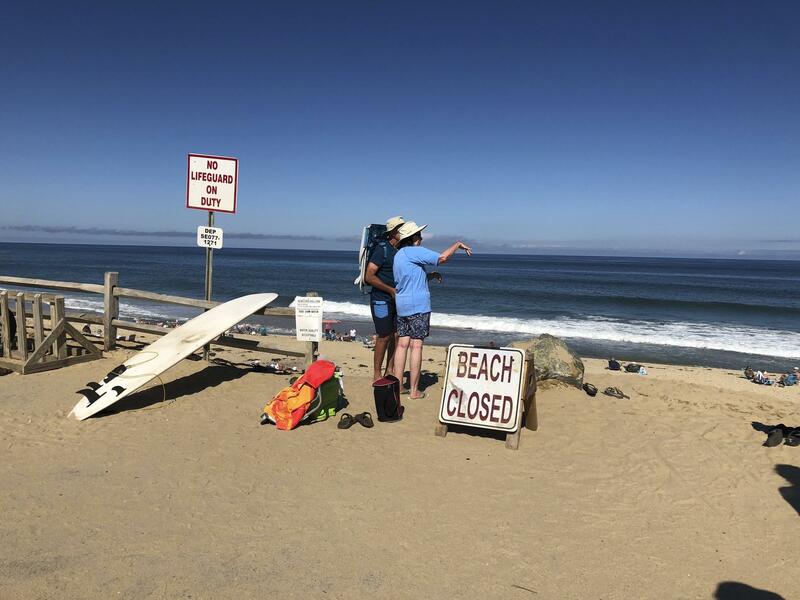 The chief ranger at the Cape Cod National Seashore, Leslie Reynolds, told the Cape Cod Times that rangers and Wellfleet police performed CPR on the victim on the beach after the bite. He was then transported to Cape Cod Hospital via ambulance, according to the Cape Cod National Park Service. The agency says the attack happened 300 yards south of the beach. A witness of the attack told the Providence Journal he saw "a giant eruption of water — 15 feet-wide. I saw a tail and a lot of thrashing." He called the incident his "worst nightmare." In August, a man was bitten by a shark at Long Nook Beach. The swimmer, William Lytton of Scarsdale, N.Y., was wading about 30 yards off of the shoreline when he was bitten — becoming the first person to be attacked by a shark in Massachusetts waters since 2012, according to WBUR. Lytton was airlifted to Tufts Medical Center in Boston, where he was treated for deep puncture wounds to his torso and leg. 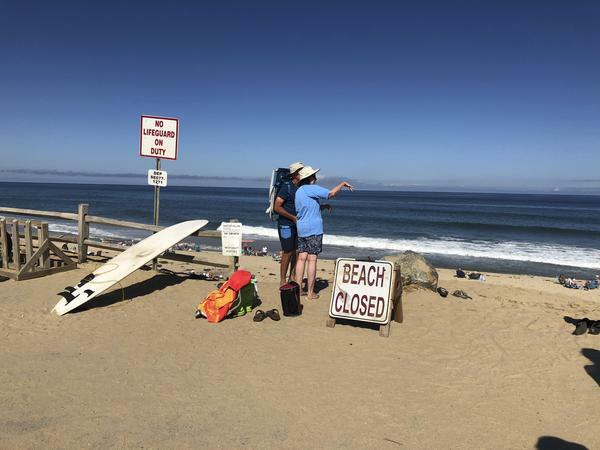 At Newcomb Hollow Beach, the site of Saturday's incident, beach goers are greeted by a sign warning them to "Be Shark Smart," according to a local CBS affiliate. "The sign advises to avoid swimming near seals, to swim close to shore in waist deep water, and to swim or surf in groups," said the CBS affiliate. Last month, the same outlet reported on a warning from Nathan Sears, a natural resources manager and harbormaster in the town of Orleans, Mass. In a Facebook post, Sears said swimmers needed to assume there are always sharks in the area or "something terrible is going to happen." "We are witnessing sharks feeding aggressively in shockingly shallow water on an almost daily basis over this past August," he wrote. "[We work] under the assumption that there are always sharks in the vicinity of the swim area."